A FAMILY WITH three children were forced to sleep rough in a Dublin park after being evicted from their rented accommodation. It’s understood the family, who are Romanian and have no English, were not evicted over a failure to pay rent, but rather as a result of problems between their landlord and the banks. The mother and father, whose children are aged five, three and two, were unable to source alternative accommodation and had been sleeping rough in the Phoenix Park before yesterday. The family’s plight first came to light following a Facebook post by homeless charity Inner City Helping Homeless (ICHH) who put the five people up in their office overnight. Before encountering the ICHH the family were referred to homeless voluntary organisation Focus Ireland by Brother Kevin Crowley of the Capuchin Centre, which provides food to the homeless. According to the ICHH the family were advised that there was nowhere available for them and were given sleeping bags, and told to ‘come back tomorrow’. “They came into my centre for food having slept in the Phoenix Park the previous night, and I referred them to Focus Ireland,” Brother Crowley told TheJournal.ie. Apparently they were found at 11.30pm last night in Mountjoy Square Park after being left out on the street. The two elder children were sleeping on a plank with the youngest in a go-car, while their parents kept watch. I’m simply horrified that this can happen in 2015. No child at that age can be left on the street. They were with us at 7.30 this morning and the children are absolutely exhausted. Focus Ireland have commented on the situation saying that the Taoiseach is failing to show the leadership needed to help end the family homelessness crisis. “The family homeless crisis is getting out of control and must now be responded to as a national emergency by the government,” the group said in a statement. 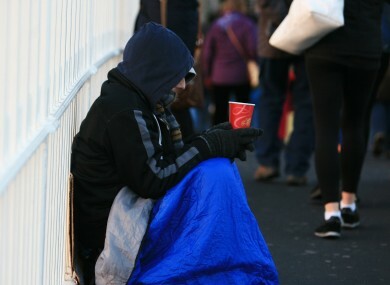 According to Focus Ireland at least five families were forced to sleep rough on the streets of Dublin in July. Christy Burke, former lord mayor of Dublin and chairman of ICHH, says that the situation is so extreme that it warrants recalling the Dáil. “Listening to the Taoiseach at Knock last Sunday, he was blowing smoke – it’s action that’s needed now, not words,” he told TheJournal.ie. This isn’t even the only family we were dealing with yesterday – another mother and her 15-year-old son have been sleeping in the A&E department of the Mater hospital for the last few nights because they’ve nowhere else to go. And we’re volunteers. We don’t receive any state funding. There’s 550 families on the homeless register at the moment – that’s 1,300 people. If that isn’t a crisis what is? Burke refused to be critical of the fact the family (who he described as “as lovely as you could meet, and so appreciative of the help we were giving them”) were turned away when looking for accommodation. Look I want to commend the homeless services on the frontline. They don’t want to be turning people away – if they don’t have any spaces they can’t just create them. The people who need to be acting are the landlords who are evicting people under false pretenses and the government. “My plea is that they won’t be on the streets tonight,” said Brother Crowley regarding the family. If I’d known what would happen to them I would have put them in a B&B myself. It’s absolutely appalling. Email “Family with three children forced to sleep in Dublin park following eviction”. Feedback on “Family with three children forced to sleep in Dublin park following eviction”.